One of my favourite animals. Although I managed to see one in the wild on a school trip in a small private ranch in Malawi, it was too quick for me to take a picture. I was also holding the spotlight, hanging on for dear life at the back of a pick-up, which was not very conducive to taking good pictures. 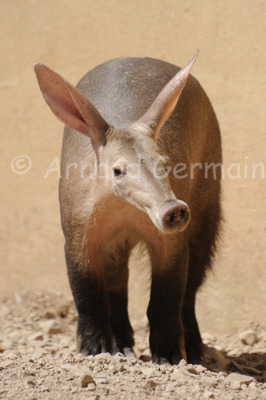 London zoo has a pair of aardvark. They do what aardvarks do best during the day, which is sleep. But they get woken up twice a day by the delicious smell of termite soup. I waited patiently for the aardvark to wake up and come and feed in front of me to take this shot. After talking to the keepers and attending both feeding sessions, I was invited to meet the aardvarks, which I was absolutely thrilled with! Nikon D700, Nikon 70-300mm VR at 300mm, F5.6, 1/1600, ISO 400, handheld.